A few harnesses equipped with light quick release buckles have experienced involuntary releases of the locking mechanism in flight and primarily with the front ( red ) Safe-T buckle. Reason : The two small protruding release mechanism on the female side of the buckle, do not come back in place to secure a fully locked position. Q : Which harness model can be affected ? Note: if your harness was upgraded with the light quick release buckles, make certain to verify the stamping on the buckles and find out if they are part of the above potentially problematic series. This problem is not relevant to the harness itself but rather to the quick release light as well as the " Safe-T " buckle. 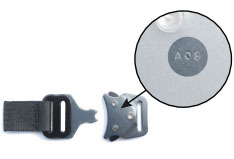 The possibly malfunctioning buckles are stamped with the following markings : A08 or B08 which corresponds to their manufacturing date ( date also indicated on the harness's label ), valid between January 2008 and July 2008. The defect is located on the female part of the buckle. Q : What should I do if my harness is part of the list ? 1 - From a Closed / Locked buckle : symmetrically depress the two ( 2 ) release protruding levers located on either side of the female buckle, pull the male buckle out then, push / lock it back into place. The two ( 2 ) protruding levers on the female buckle section, MUST extend out FULLY again ( see graphics ). Repeat the whole sequence three ( 3 ) times. 2 - From an Open / Unlocked buckle : symmetrically depress the two ( 2 ) release protruding levers located on either side of the female buckle, and push / lock the male section into place. The two ( 2 ) protruding levers on the female buckle section, MUST extend out FULLY again ( see graphics ). Repeat the whole sequence three ( 3 ) times. 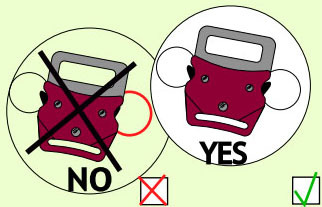 Note : Regarding the red Safe-T buckle, the test sequence MUST be repeated for both female sections on either side of the central male insert or twice per Safe-T buckle. If, in any case, one ( 1 ) or two ( 2 ) of the protruding small levers do not come back to their initial locked position, we will ask you to contact us in order to choose the best shipping solution to send your harness back to our facility via your usual dealer or to us. Sup'Air will cover all shipping costs ( both ways ) including the necessary repairs. Note : SUP'AIR takes pride in its manufacturing process, top quality gear and quality control. Please accept our apologies in advance for any possible inconvenience you may encounter with your harness. We will work to the best of our abilities to correct the problem and make certain you will resume flying as soon as possible with full confidence. IMPORTANT : in any case and regardless of the quick release buckles used, you MUST and prior takeoff, run through a systematic pre-flight check list to insure for all to be properly locked and secured in place. Pay especially attention to the locking sequence and mechanism in a snowy or sandy environment. Always be VERY careful and aware of your gear's functionality. In the event of discovering a problem, please contact Sup'Air if it is a Sup'Air harness or Gin if a Gin harness for further details.